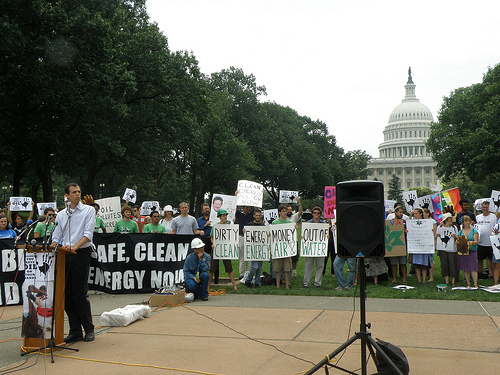 Robert Weissman speaks about oil companies' influence in Congress at a demonstration on Capitol Hill July 20. We just got back from Capitol Hill where Public Citizen President Robert Weissman spoke about the powers of corporations in Congress and about shifting our economies to sustainable forms of energy. The first step is to get the oil money out of Congress. We’ve got to clean up Congress. We need clean money in our elections. We’ve written about the dangers of the diabetes drug Avandia and have told Congress about an unethical international clinical trial, requested by the FDA, being performed by Avandia’s manufacturer, GlaxoSmithKline. Now Public Citizen and Canadian researcher/physician David Juurlink go straight to the source, sending a letter to FDA Commissioner Margaret Hamburg asking her to halt the study, which pits Avandia against its competitor, Actos. “A wealth of data now suggests” that Avandia carries greater risks than Actos, the researchers said. Patients are also not adequately informed about the safety differences between the two medicines when deciding whether to participate in the trial, they added. But FDA officials, who have said they are already taking a closer look at Avandia, are not likely to act so quickly. In act, both drugs [Avandia and Actos] have been tagged with safety issues: In addition to raising rates of cardiovascular events, the class of Type 2 diabetes drugs known as thiazolidinediones (or TZDs) have been linked in studies to higher rates of edema, macular edema, bony fractures, anemia and acute liver injury. Older diabetes medicine such as metformin and sulfonylurea are widely believed to be safer alternatives. But to no avail — the FDA likely won’t examine the study until July, FiercePharma reports. Want an in-depth look at the legislative struggle for financial reform in Congress? Read this excellent article from the Huffington Post’s Laura Bassett, Jeff Muskus and Elyse Siegel. It’s chock full of revealing eye-openers that show why passing strong financial regulation to rein in Wall Street is so difficult. The authors show that the revolving door between the lobbying industry and Congress sustains a culture of pandering to big business interests that at the same time marginalizes the progressives who fight for stronger reforms. It’s a must-read for all who care about financial reform, and it provides an insightful case study for why we need campaign finance reform to prevent our elected representatives from being bought and sold. (And it’s sure to provide some lessons we’ll need to apply in the fast-approaching fight for strong financial reform legislation in the Senate). Everybody knows that insider trading is illegal. Wall Street big wigs who get caught giving their cronies valuable information before it’s made public go to jail. Yet, those same rules don’t apply in the halls of Congress where members, their staffs and other federal officials can use the inside information they gather about upcoming legislation for their own financial gain. You have to ask yourself if it is wise policy to create a new derivatives market on the heels of the collapse of derivatives markets, and I don’t think it is. And those aren’t the only questions Public Citizen is asking. We’ve all seen the recent images of irate constituents yelling at their representatives during town hall debates on health care reform. But is this anger home-grown or organized by businesses and interest groups whose bottom line could be hurt by reform? This goes below the radar. We don’t know who is behind it or who pays for it. We don’t know how much of it is happening. And then MSNBC’s Rachel Maddow digs deeper. Yes, it seems amazing on its face. Under current laws (or lack thereof), members of Congress and high-powered executive branch appointees can exploit “insider” knowledge of the financial industry to turn personal profit. Basically, had Martha Stewart been a member of Congress, she wouldn’t have been sent to the slammer for five months and ordered to wear an ankle bracelet for another five for convictions related to insider trading .